I he Jack Russell Terrier is small in size but big in I attitude. This dog is highly intelligent and expressive, brave to the point of abandon, ever ready for action and mayhem. They are also loving dogs with a great sense of humor who treasure their contact with humans. Although adaptable, this breed demands an enormous amount of physical and mental activity. Those who discover they are the pet humans of these dogs always have funny stories to exchange. The Jack Russell comes in many sizes. They may be as small as ten inches at the top of the shoulder (called the withers) or as much as fifteen inches. The range in size ensures each dog will be the size needed for the work or the terrain he hunts in. 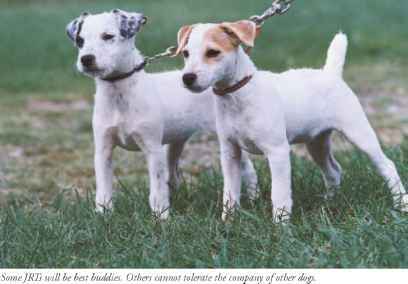 JRTs come mostly white with brown or black markings. Whatever the size and shape, they have captured the hearts of all those charmed by their in-your-face attitude. The Jack Russell Terrier was developed to meet a formidable opponent below ground, the red fox (although JRTs also hunt other quarry). He was blended from now extinct strains of white-bodied terriers in Great Britain. With a dash of this working breed and a dash of that one, a hearty, healthy, keen, earth-working dog was shaped to the job of hunting. The Latin word terra means earth, and that is the origin of the word "terrier"—earth dog. First and foremost, the Jack Russell Terrier is a hunting dog who works below ground. The dog's job is to keep the fox in check while the handler digs to both the fox and the dog. 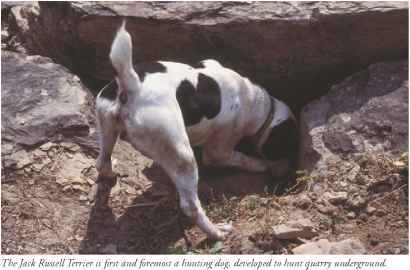 The dog has to possess a good voice to address the quarry below ground when located, to help keep the prey at bay, and to help the handler locate the dog by sound. Everything about the dog reflects his job as hunter. It is said about the Jack Russell Terrier that where the fox can go, so must the terrier. This terrier's structure is modeled after that of the vixen (female fox). Like the fox, the Jack Russell must be well angulated and possess a small, compressible chest that enables him to maneuver in narrow earthen tunnels, often deeply below ground. The predominantly white coat is to help distinguish the dog from the fox when the hunter digs to where the dog holds his quarry at bay. The intense character is all part of the hunting package, as well. Without a doubt, the Jack Russell is a courageous companion with the grit to hunt. The intelligence of the dog adds to the package, because the dog must independently solve problems below ground and hold himself back from taking on the quarry; a dog too eager to do battle below ground is apt to be lost. The breed was not meant to harm the quarry he encounters. Still, JRTs do have different styles of work. Some are "hard" and engage their quarry with intent to inflict harm, while and some are "soft" and bay at or dislodge their quarry with their intense presence. All JRTs, however, should have the attitude, grit, and tenacity to confront larger and more formidable animals below ground. A very intelligent and cooperative Jack Russell may sometimes be called out of the den by the handler, but don't count on it! The Jack Russell Terrier is seen often on television and in the movies. Because they are expressive and exceptionally intelligent, they are often used in commercials, which gives the (incorrect) impression that this is a very mannerly dog. The dog you see in a commercial or on a television show is a very good actor and has a trainer who possesses a great deal of time and patience in teaching the dog a series of actions with hand signals or commands. The dog has spent a lot of time working— engaging his body and mind—to learn these moves. And when he is off camera, he is just as active as ever. People get the idea all Jack Russells are like the television dogs, and then find the dog they have is locked in the "on" position, a rocket in motion. This is not the breed for the faint of heart or those who want a relaxed dog. The Jack Russell is ready for action and a lot of it! The courage of the Jack Russell Terrier must be understood and accepted, whether you hunt with your dog or not. The dog's behavior may be described as total abandon. 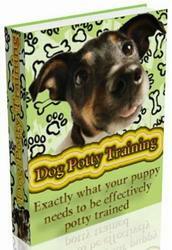 The instincts of the dog may make him act with single-mindedness in both work and play. You must be prepared to protect the dog from himself and always expect the unexpected. Jack Russells relish close contact with the humans they love. They are very adaptable in many ways, but they do demand enormous amounts of physical and mental activity that are meaningful and satisfying to the dog. It is not easy to wear one out. Jack Russells also have an assertive nature and require discipline and acceptance of their pluck and courage. They pack a big-dog attitude. They can sometimes be bullies to the biggest dogs they encounter, but they can also curl up for a nap next to a beloved companion. There are many ways to provide fun outlets for the dog's energy. If you spend time tossing a ball or Frisbee at a set time each day, the dog will anticipate this quality activity time. It is wise not to encourage too much tug of war, because these dogs can develop an attitude of always wanting to be the winner, which may encourage behavior that is too assertive. Arrange the game of tug or toss so you and the dog take turns winning. The Jack Russell Terrier needs to know that the humans in his family, including the children, hold a rank in the family pack that is higher than his. This is not the dog to lend your car keys or credit cards to.